At primary time, the herd of GOP candidates are known to trumpet change and stomp the competition. This thins the herd and allows them to charge their Democratic contenders in the fall elections. Here are a few elephant races to watch on June 26. There are many ways to define the contest between Orrin Hatch, a 36-year Washington, D.C., incumbent, and his upstart challenger Dan Liljenquist, the former state senator from Bountiful. Ultimately, what the race boils down to is 2010—the year vocal tea-partying elements of the party realized they could unseat longtime incumbent U.S. Sen. Bob Bennett, R-Utah. “Hatch had the benefit of seeing what happened to Bennett,” says University of Utah political-science professor Matthew Burbank, “which motivated him to take the primary very seriously”—seriously enough that Hatch helped pour millions into attracting new delegates to neighborhood caucuses and the state convention, a move that significantly turned down the volume on tea-party elements in the party. According to research from Brigham Young University’s Center for the Study of Elections & Democracy, 57 percent of delegates in 2012 expressed a favorable attitude toward the tea party, compared to 86 percent of 2010 delegates. Still, Liljenquist has credentials to stand on. The passionate policy wonk helped implement Utah’s public-employee pension reform that, in 2010, closed off enrollment for new employees in favor of a defined-contribution plan. The plan angered many new government employees but earned the freshman senator kudos from voters by helping ensure the retirement program wouldn’t bankrupt the state in the future. Liljenquist also took on Medicaid reform in 2011 and pushed for a system that covered quality-of-care outcomes in the system, as opposed to just the quantity of services provided. In 2012, however, the feds denied components of the reform, such as raising the price of Medicaid co-pays. While Liljenquist fashions himself an idea man, Hatch has touted himself as a leader in the Senate who is poised to turn ideas into reality. If he’s re-elected and Republicans take the Senate in November, Hatch could be the chair of the powerful Senate Finance Committee. It’s a position from which he could make it rain appropriations for Utah, spearhead entitlement reform or try to untangle the tax code, among other plans. Adam Brown, a professor of political science at Brigham Young University, says that while Hatch did well at the convention—garnering 59 percent of the vote—the turnout at the June 26 primary could be different based on presidential politics. The scandal that erupted in 2011 when West Valley City Mayor Mike Winder confessed to writing positive stories about his city for the Deseret News under the pen name of Richard Burwash has turned out to be “the scandal that wasn’t” for his current race to be the GOP’s nomination for Salt Lake County Mayor. The U’s Burbank says that since the story has been out, it’s lost heft in the current race. “It’s not an ‘Oh, gee, I didn’t know that about this guy’ fact,” Burbank says. “People have already factored this in.” At a recent debate, Winder even touted the controversy and the fact that he owned up to it as proof that he doesn’t hold back from his constituents. For Burbank, the old scandal leaves it to a close race between two different candidate styles: Winder leading the county on policy issues, and Crockett, a successful business consultant and longtime member of the Salt Lake County Council, as one looking to rein in spending and curtail county investments in unnecessary bonds. Sean Reyes has campaigned to run the Attorney General’s Office like a law firm and less like a policy-making agency. He has criticized the current office for making political crusades and says the state needs lawyers running the office instead of politicians. John Swallow has embraced a platform that seeks to tackle larger policy goals, like defeating President Barack Obama’s Affordable Care Act and fighting for Utah’s public lands. Swallow previously was a lobbyist for payday lenders, worked on Attorney General Mark Shurtleff’s previous political campaigns and served in the Legislature in the late ’90s. Reyes became one of the first minority partners in law firm Parsons, Behle & Latimer. While Reyes is also critical of federal control of public lands and “Obamacare,” he has eschewed the office as being a policy-making body. In the past, Reyes has helped set up Utah “fraud college” events that educate Utahns about investment scammers, and in a January 2012 Economist article voiced support for a kind of registry to keep tabs on repeat financial fraudsters. The campaign has been marred by negative attacks from fringe elements. Prior to the April convention, a video was released showing a man on the hood of a moving car beating on the windshield, a reference to a 2008 City Weekly profile of Reyes that included mention of a time in the ’90s that Reyes chased after some high school kids who had egged his car. 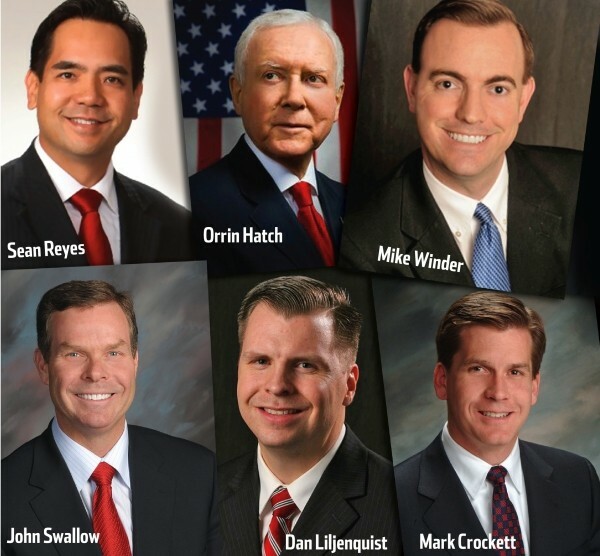 Recently, the mysterious Ute PAC sent a mailer alleging Swallow could face imminent indictment for abusing his power at the Attorney General’s Office on behalf of a company that lost out on a lucrative emissions-testing contract with Salt Lake County. The Salt Lake Tribune reported that the FBI did hold an investigation and subpoenaed Swallow and other members of the Attorney General’s Office in 2011, but no official determinations have been made, and the target of the federal investigation was never clearly identified.